The traditional summer training camp “iceDome” was once again very successful in June and July. A true highlight for everybody participating obviously was the new edition of the show “Musicals on Ice”. Approximately 80 skaters from 25 countries came to Oberstdorf to prepare for the new, Olympic season, in the first iceDome camp. They worked with top coaches and choreographers such as Michael Huth, Peter Grütter, Stanick Jeannette, Rostislav Sinicyn, Martin Skotnicky, Vlasta Koprivova, Alexander König and others. Ballet and athletic training with professional coaches completed the off- ice program of the camp. The most prominent skaters were 2012 World Champion Carolina Kostner (Italy), 2008 European Champion Tomas Verner (Czech Republic) and German Ice Dance Champions Nelli Zhiganshina/Alexander Gazsi. The show on July 12 featured these top stars and many more skaters. Once again, the skaters impressed with solo and various group numbers to Musical hits. 1250 spectators had come to watch the show. The show opened with a group number to Peter Pan with Joti Polizoakis (Germany) in the lead role, Marcus Björk (Sweden) as colorful native American chief, Alexander Gazsi as Captain Hook and his pirates Tomas Verner, Matej Novak (Czech Republic), Ruben Blommaert (Germany) and Anton Kovalevski (Ukraine). More than 50 young skaters were on the ice for this number. Jennifer Parker (Germany) then skated to “Les Miserables”. The new pairs team of Amani Fancy/Christopher Boyadji (Great Britain) had their first public appearance in a number to “Cinderella”. Darja Zaychenko (Czech Republic) came as “Matilda” on the ice. Joti Polizoakis came back with “Singin’ in the rain”, a classical, beautiful interpretation of this well known piece that really showed off his strong presentation and dance ability. Nelli Zhiganshina/Alexander Gazsi were “Romeo and Julia” and incorporated their spectacular aerial acrobatics into the program. Jennifer Urban (Germany) was the perfect “Pocahontas”. Carolina Kostner concluded the first part of the show with “Mein Herr” from Cabaret, complete with a black wig and playing around with partner Matej Novak. The second part started off with the group number “Rock of Ages”, performers included Tomas Verner and German Pair Champions Annabelle Prölß/Ruben Blommaert. Those two stayed on the ice for “West Side Story” as Tony and Maria. Nelli Zhiganshina played the role of “Evita” in her solo aerial number, supported by Alexander Sinicyn and several other male ice dancers. 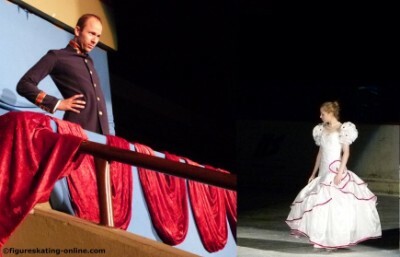 Nelli’s regular partner Alexander Gazsi was unfaithful as well, performing as Emperor Franz together with Carolina Kostner as “Sissi” to “Elisabeth”. Tomas Verner and Anton Kovalevski entertained the crowd as Carmen (Tomas) and Don José (Anton) in a fun parody on this skating’s “war horse”. The “Starlight Express” was the final group number and united all participants of the camp again. “The kids have a lot of fun and it is very motivating for them to train with the ‘big ones’”, Huth said. “Some of them are coming back year by year. We have some Norvegian skaters who have been coming for six or seven years and they are progressing.” Head coach Huth was pleased with how Tomas Verner and Carolina Kostner had been working in the summer, as well as with his German students Joti Polizoakis, Jennifer Urban and Jennifer Parker.